Not to be confused with the Cape York Peninsula in Queensland. For other uses, see Yorke Peninsula. The Yorke Peninsula is a peninsula located north-west and west of Adelaide in South Australia, between Spencer Gulf on the west and Gulf St Vincent on the east. The peninsula is separated from Kangaroo Island to the south by Investigator Strait. The most populous town in the region is Kadina. Prior to European settlement, which commenced around 1840, Yorke Peninsula was the home to the Narungga people. Today the descendants of these people still live on Yorke Peninsula, supported by the Narungga Aboriginal Progress Association in Maitland, and in the community at Point Pearce. Yorke Peninsula was named by Captain Matthew Flinders, R.N., after the Right Honourable Charles Philip Yorke (1764–1834) (later Lord Hardwicke), narrowly beating French navigator Captain Nicolas Baudin (who preferred the name 'Cambaceres Peninsula'). 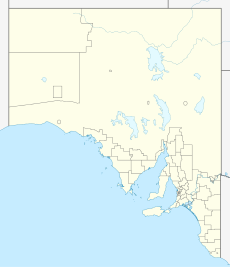 Principal towns include the Copper Coast towns of Kadina, Moonta and Wallaroo; farming centres of Maitland, Minlaton and Yorketown; and the port of Ardrossan. A number of smaller coastal towns are popular destinations for fishing and holidays, particularly for people from Adelaide. The south-western tip is occupied by Innes National Park. Yorke Peninsula is a major producer of grain, particularly barley and the Peninsula's grain crops are worth more than $290 million annually. Historically this has been sent out by sea because there are no rail services. Most coastal towns on the peninsula have substantial jetties. In the past these were used by ketches, schooners, and later steamships, to collect the grain in bags, and deliver fertiliser and other supplies. As roads in the region improved, and freight-handling techniques changed from bags to bulk, this became obsolete. A deep-water port was opened in 1970 near the south-eastern tip at Port Giles to export grain in bulk, and almost all the other ports ceased to be used for freight in the 1950s and 1960s. The only other ports with bulk-handling facilities are Wallaroo at the north-western side, and Ardrossan at the top of Gulf St Vincent, also used to ship dolomite from a nearby mine for OneSteel. Maitland has a grain-receiving depot operated by AWB, serviced only by road. Wine production commenced on the Peninsula during the 1990s taking advantage of the rich grey, limestone-based soil. Acknowledged as Australia's oldest Field Days, the Yorke Peninsula Field Days have been held since 1894. The Field Days site just outside Paskeville is a hive of agricultural activity every 2 years, at the end of September. The area is also known as the Yorke Horst, which is distinct physiographic section of the larger South Australian Shatter Belt province, which in turn is part of the larger West Australian Shield physiographic division. Along with Cape Eyre the peninsula is also part of the Eyre Yorke Block bioregion. Most of Yorke Peninsula is prime agricultural land, with mostly small rolling hills and flat plains. The southern end of the Hummocks Range partially extends down the top of the Peninsula, flattening out near Clinton. The highest point on the Peninsula is 5km north-east of Maitland, although there is some debate as to where the Peninsula borders the Mid North, part of the steep Hummocks terrain may be considered part of the Peninsula. A series of shallow valleys line the interior of the Peninsula, with the main one called the Yorke Valley extending roughly from Sunnyvale, south of Paskeville through to Ramsey, between Minlaton and Stansbury. The predominant Yorke Valley area lies roughly in the area between Arthurton, Maitland, Ardrossan and Curramulka. Typical of the southern coastal areas of the state and influenced by the surrounding bodies of water, Yorke Peninsula has a Mediterranean climate, (Koppen: borderline Csa/Csb) with some areas bordering a Semi Arid Climate, with hot, dry summer and cool, wet winter seasons. Maximum temperatures in summer average around 30 degrees and in winter average around 12-15. Due to surrounding bodies of water, winter temperatures are moderated and milder than most of the state, with overnight temperatures rarely falling below 0, making frost relatively uncommon in the region but not unheard of. Northerly winds from the desert can bring temperatures well upwards of 40 degrees in summer and occasionally bring very warm winter days well into the 20's. Average precipitation is 4-600mm, most of which falls from mid April through to September, though total and seasonal rainfall can vary greatly from year to year. Along with most of southern Australia, monsoonal lows from the north occasionally bring heavy storm events during spring and summer, rainfall is otherwise light and unreliable due to high pressure systems dominating the area. As of 2015, a daily ferry service operates between Wallaroo and Lucky Bay, near Cowell on Eyre Peninsula. Harry Bartlett (1835–1915) MHA for Yorke Peninsula 1887–1896, dubbed "Father of the West Coast". Conservation parks - Althorpe Islands, Bird Islands, Carribie, Clinton, Leven Beach, Minlacowie, Point Davenport, Ramsay, Thidna, Troubridge Island, Warrenben and Wills Creek. Yorke Peninsula hosts two Important Bird Areas (IBA): the Gulf St Vincent Important Bird Area and the Southern Yorke Peninsula Important Bird Area. The Gulf St Vincent IBA covers a strip of intertidal land from Ardrossan to the head of Gulf St Vincent and onto the east coast of the gulf. The Southern Yorke Peninsula IBA covers most of the southern western tip of the Peninsula and overlaps Innes National Park and Warrenben Conservation Park. Since the discovery of Copper on Yorke Peninsula over 150 years ago, the towns of Kadina, Moonta and Wallaroo have been collectively known as the Copper Coast. The world's largest Cornish Festival takes place every 2 years (in odd-numbered years) in the Copper Coast towns of Kadina, Moonta and Wallaroo. ^ "Population health profile of the Yorke Peninsula" (PDF). Archived from the original (PDF) on 17 March 2012. Retrieved 29 May 2012. ^ "District of Frome Background Profile". ELECTORAL COMMISSION SA. Retrieved 3 November 2014. ^ "District of Goyder Background Profile". ELECTORAL COMMISSION SA. Retrieved 3 November 2014. ^ "Barley Stacks Wines". Barley Stacks Wines. Archived from the original on 30 November 2014. Retrieved 31 October 2014. ^ Yorke Peninsula Field Days website, The Yorke Peninsula Field Days are acknowledged as the oldest in Australia with the first trial held near Bute, SA, on 31 July 1895. ^ "About Us". Sea SA Pty Lty. Archived from the original on 17 October 2015. Retrieved 24 October 2015. ^ a b Sonny Coombs (23 February 2016). "Brothers make AFL debut". Yorke Peninsula Country Times. Retrieved 4 June 2016. ^ a b "Parks Guide 2013 - Yorke Peninsula and Clare Valley" (PDF). Department of Environment, Water and Natural Resources. 2013. pp. 73–74. Retrieved 31 October 2014. ^ "Important Bird Areas factsheet: Gulf St Vincent". BirdLife International. 2014. Retrieved 21 October 2014. ^ "Important Bird Areas factsheet: Southern Yorke Peninsula". BirdLife International. 2014. Retrieved 30 October 2014. Wikimedia Commons has media related to Yorke Peninsula. Wikivoyage has a travel guide for Yorke Peninsula.